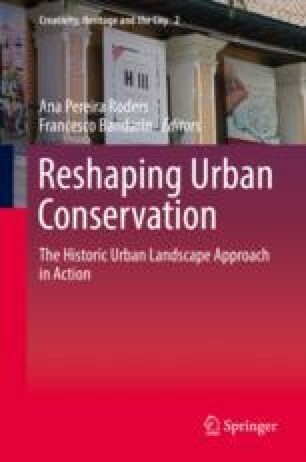 The UNESCO Recommendations on Historic Urban Landscape (2011) recognises the fundamental role of cultural heritage and landscape for sustainable local development. The operative tool available for the assessment of the impacts of requalification projects on historic urban landscape is the heritage impact assessment (HIA). In this research, HIA has been applied to evaluate the impacts of a requalification project for Torre Annunziata waterfront. The aim is to demonstrate that this method is a fundamental tool to understand the impacts on the integrity and authenticity of heritage resources, but not enough to define the tangible and intangible values of the cultural heritage, that assume different features in the different international urban areas. This tool lacks an economic and social perspective and a certain evaluation of the impacts for different planning strategies. In this paper, a new tool has been proposed to assess the economic and social impacts of cultural heritage conservation/transformation/regeneration, allowing interdisciplinary research and collaboration among stakeholders, capable of defining some guidelines to improve requalification projects in a win-win perspective. The results of this new method have been used to define a new project for Torre Annunziata waterfront based on the principles of the “circular economy”. Subsequently some key indicators have been identified to measure the economic, social and environmental performance of the project. The circular economy is capable of restoring the city’s identity and increasing the tangible and intangible value, according to the UNESCO recommendations. De Figueiredo, P.(2011). Liverpool waters heritage impact assessment. Assessment of potential effects on the Liverpool World Heritage Sites. www.liverpoolwaters. Fellner, J, Lederer, J., Scharff, C., Laner, D. (2017). Present potentials and limitations of a circular economy with respect to primary raw material demand. Available at: http://www.cec4europe.eu/fileadmin. Sitra (2015). The opportunities of a circular economy for Finland. Available at: https://media.sitra.fi. UNESCO. (2011). Recommendation on the historic urban landscape, including a glossary of definitions. In: Available at: http://portal.unesco.org. Van der Does de Bye, M., Van der Vusse, R., & Van Tilborg C. (2015). Roadmap circular economy Rotterdam. In: Available at: http://www.rotterdamclimateinitiative.nl/documents. Zils, M. (2015). Towards a circular economy rethinking value chains to boost resource productivity. In: Available at: http://www.environnement.brussels. http://www.reinventer.paris/en/sites.